Customers are seeking more mobility than ever - tablet pieces and net books offer just that, and We have designed a desk to incorporate their flexibility with the safety and ergonomics you have come to expect from an AutoExec desk. 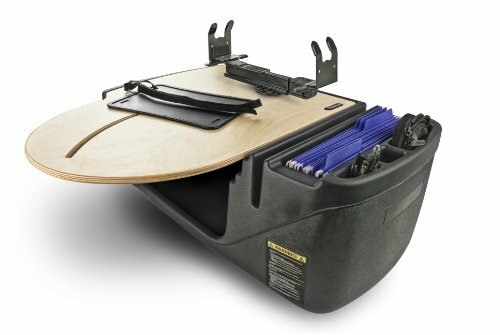 This specially designed desk has a spring-loaded net book holder on an adjustable arm. The arm swings from side to side, and the net book holder can be tilted to the most ergonomically comfortable position for you. Adjust it to your preferred position, and then lock it into place with the comfort-grip knob located under the top of the desk. This desk can hold a laptop that is between 8.5 inches and 11 inches wide. This new desk will give you complete range of motion with your compact laptops while retaining the storage space the auto exec desks have always offered. As with All AutoExec desks, this desk will secure in your vehicle with the seat-belt. Fits most trucks and SUV's. The 21'' wide top has an adjustable laptop plate so the laptop can be moved to a comfortable, ergonomic position for typing. The laptop plate extends past the edge of the desk by another 3'' making it 24'' of overall reach from the far edge of the desk. Secure the laptop to the plate with the supplied Velcro and security strap. Secure the desk with the vehicle's seat belt. Safely store your laptop in compartment under work surface when not in use. Side storage area great for hanging files and other office needs. Fits most cars, smaller SUVs and mini vans. Universal PDA/Cell Phone Mount features a multi-angle ratcheting pedestal and side-grip ratcheting mechanism with a simple push button release. Your PDA/cell phone is held securely in place by the soft, cushioned side-grip arms of the cradle. When you need to remove your PDA/cell phone from the cradle, simply press the push button release. 400 Watt Power Inverter has an 800-watt peak surge power. A built-in, high speed cooling fan helps keep the unit cool, and there is an On/Off switch and LED indicator. 2 USB ports. Ideal for running computers, cell phones, lights, stereos, radios, and CD players. AutoExec has truly helped put the laptop in a position that is easy to use and type. The Roadmaster is one of the more ergonomic solutions available today. The 21" wide top has an adjustable laptop plate so the laptop can be moved to a comfortable position for typing. The laptop plate extends past the edge of the desk by another 3 inches making it 24" of overall reach from the far edge of the desk. Along with the comfort features of this product, you can enjoy hanging File space, and a hidden storage area. This will help keep valuables out of sight and make sure you are organized. Secure the desk with the seat belt in your vehicle. Secure the laptop to the plate by using the included Velcro strap. Fits most cars, smaller SUV's, and Mini-vans. AutoExec has created a way to make mobile working on the road easy and comfortable. If a laptop is part of your daily work arsenal, then this desk is for you. Mounting your laptop is easy and makes working in the vehicle rewarding. Improve productivity while working in your "mobile office" and relax knowing your valuables are tucked away in the hidden storage space of your desk. 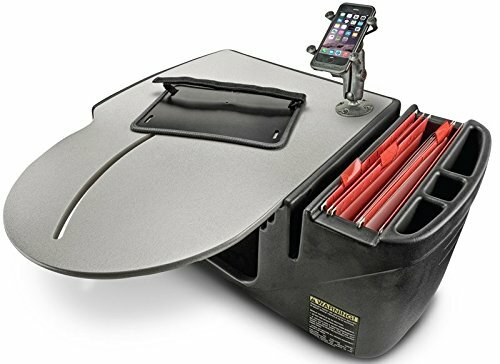 The AutoExec RoadMaster Car is designed to support small to large laptops. The laptop is securely fastened to the desk using an adjustable steel mounting plate that can be moved forward and backwards as desired to reach a comfortable typing position. Storing devices or other valuables can be done in the hidden storage space below the wooden top. 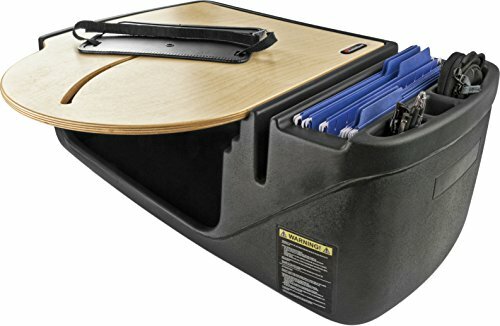 This space along with the file storage, makes organization much easier. This specific model is designed for most sedans, smaller SUVs, and mini vans. The RoadMaster Car Elite series comes with a beautiful Baltic birch wood surface that mates well with the rugged base. 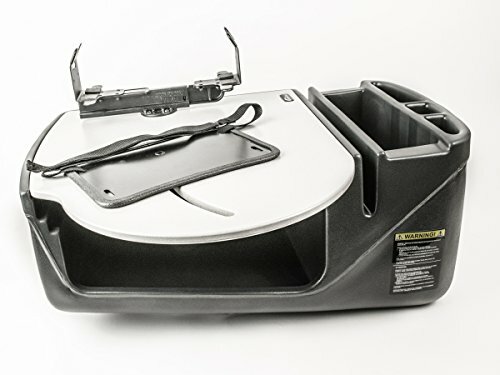 The desk seat belts easily into the front passenger seat and can be installed or removed in seconds. 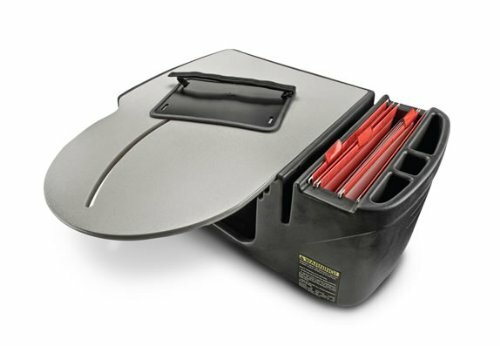 The rounded plastic base is smooth and is gentle on your seat and the curved base is designed to keep your work surface level so your office essentials don't tip over. 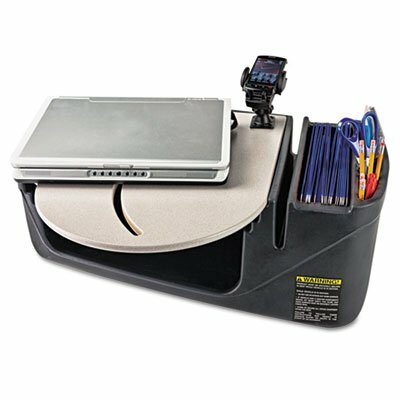 Car desk with a secured laptop support system creates a productive work environment in the vehicle. Top has an adjustable laptop plate so the laptop can be moved to a comfortable, ergonomic position for typing. Secure the laptop to the plate with the supplied Velcro and security strap. Secure the desk with the vehicle's seat belt. Fits most cars, smaller SUVs and mini vans. Includes PDA/cell phone mount and 400 Watt Power Inverter. 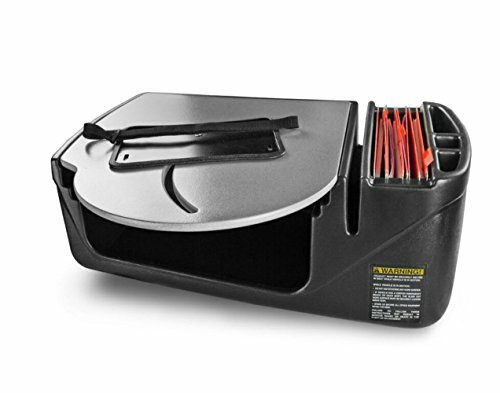 Desktop Supplies Organizer Type: Desktop Sorter; Overall Width: 21 1/4"; Overall Depth: 15 1/8"; Overall Height: 11". The AutoExec Roadmaster truck version is ideal for people working out of their vehicle that predominately use a laptop. The adjustable laptop plate comes with a strap and Velcro to help secure it to the desk-top. Move it closer to you while typing and then move it back to the center of the desk while the vehicle is in motion. 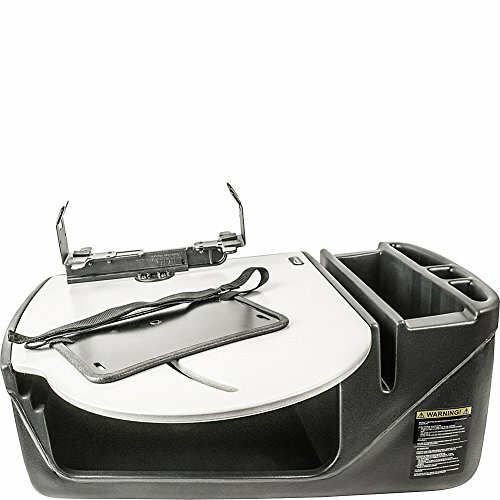 The auto exec Roadmaster offers laptop positioning similar to a floor mounted computer stand without the installation and permanent mount. 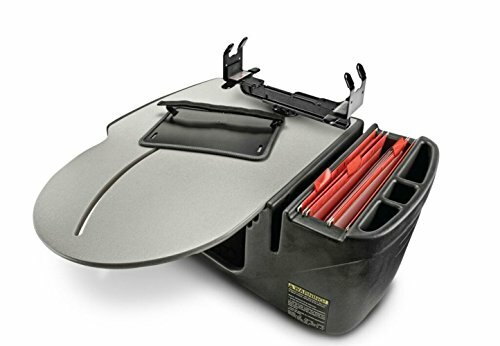 In addition, store your hanging File folders in the desk as well as other office essentials in the storage area under the work-surface. This desk is a complete mobile office which is secured to the passenger seat by using the seat-belt. AutoExec has created a way to make mobile working on the road easy and comfortable. If a laptop and printer are part of your daily work arsenal, then this desk is for you. Copyright © Wholesalion.com 2019 - The Best Prices On Autoexec Roadmaster Laptop Online.